Bathymetric map of the East Pacific Rise focused study area near 9°50'N showing the locations of high and low-temperature vents prior to and after the 2005-2006 eruptions. Vent locations active before the 2005-2006 eruptions are labeled on right. All except those labeled in blue continued to be active after the 2005-2006 eruptions. 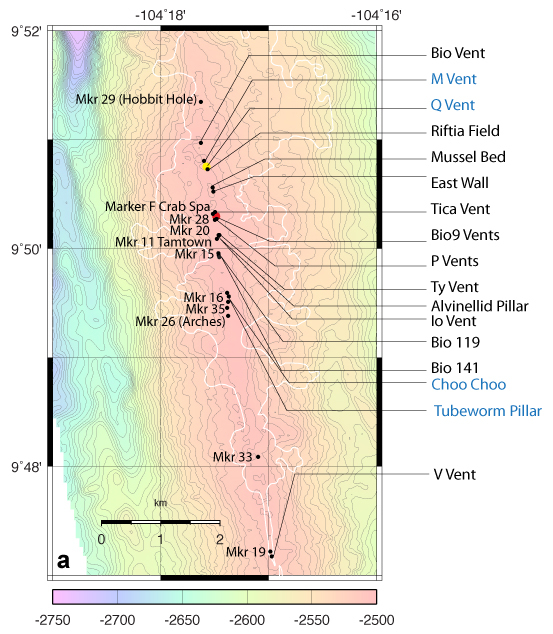 New vent sites that became active after the latest eruptions and were sites of experiment deployments and sampling are labeled on left (e.g., Mkr #s). Red dot on Bio9 vent location and yellow dot on Q vent location are reproduced on Figures 3b and 3c for reference. The estimated extent of 2005-2006 lava flows between 9°47.5' and 9°55.7'N is shown as a white line and is based on images acquired by TowCam and Alvin during several cruises to the area [Cowen et al. 2007; Soule et al. 2007; Fundis et al., 2010]. Maps were compiled using bathymetric data available at the MGDS Ridge 2000 Data Portal [Carbotte et al., 2004; Ryan et al., 2009] (http://www.marine-geo.org/index.php).